This is the third time recently that I have found myself with leftover chorizo, and this is the third time that I've sat there wondering what to do with it. It isn't a a food that I'm used to eating a lot of, though it has gone up in my estimations enormously recently. Here I wanted to see how it worked with salmon, and I think it works very well. The cannellini bean and chorizo base is almost like extremely posh baked beans, and the aubergine balances it beautifully. I personally love the chilli crust on the salmon, though those less inclined towards fire may wish to give it a miss. Just don't tell me you did so! Dice the chorizo, then fry without any oil (it has plenty of its own) until crisp then add the cannellini beans - I used tinned here to save time. Gently fry for 5 minutes with the chorizo, then while the beans are frying, remove the seeds and core from the tomatoes, dice and add to the pan. Next, add the chicken stock and 2 tbsp of balsamic vinegar and gently reduce. Roughly chop the coriander and stir into the mix. Turn off the heat and set aside for the time being. Next, dice the aubergines and fry in enough oil for them to soften and disintegrate, then after a couple of minutes frying add the garlic and cook for a further couple of minutes. You should have a soft, pulpy paste. Turn off the heat and set this aside too. Finally, crust both salmon fillets with the chilli flakes - you may need a little more or less, but don't put too much on or the salmon will be extremely hot - then drizzle with a little olive oil. Finally, fry them in a hot frying pan with a little oil, skin side down at first for about three minutes, then flip over and sear the top for a couple of minutes. While the salmon is frying, give a quick blast of heat to the beans and aubergine, then divide the beans between two plates. 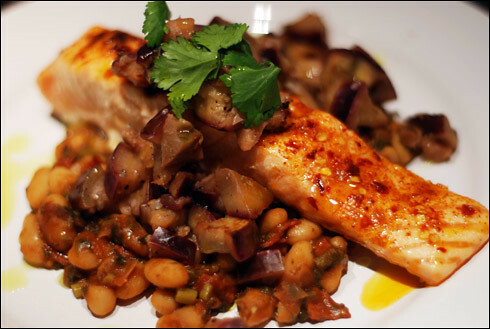 Once the salmon is cooked, place skin side down on the beans and spoon the aubergine on top. Garnish with a sprig of coriander.